I promised some LJ’s to make a review of my lathe. The CL1 fills the gap between the DML Lathes and larger CL3, ideally suited to satisfy the more demanding turner who doesn’t require the big bowl capacities offered by the CL3 or CL4. The CL1 is a heavy weight cast iron lathe with solid chromed bed bars; in fact these are the same bed bars which are fitted to the professional standard CL3 and CL4 lathes. Also shared with these larger lathes is the No. 1 MT tailstock, a beefy item which carries plenty of weight to dampen vibration when spindle turning. The headstock is cast grey iron and fitted with sealed for life maintenance free bearings ensuring smooth running and offering generous capacities, up to 15” if the headstock is swiveled. This lathe is perfect for the serious wood turner who requires a versatile yet reasonably priced lathe. Before i start I must admit I’m no great turner, I have used it to make app. fifty pieces or so, mostly tool handles, some mallets but also other stuff and even a little bowl, but this means I’m still a beginner and had no teaching so I just take it as it comes and have great fun. The lathe is really stabile, the motor runs smooth and seems strong, so it is more my limited arm power that are the problem, smiles. In my little workshop it is brilliant that the lathe can be put apart in a matter of minutes and then takes really little place. Due to the extremely heavy solid metal rods that it is the base of the lathe, it is rock solid once set up and I have no problems with vibration (I fasten it to my Festool MFT3 table). Spindle runs 450 950 200 rpm, speed is changed by hand. The head has a SWIVELHEAD so it can be turned to the side and used for big turnings like bowls. So to be honest I have nothing negative to say, of course it could be cool with an electronic motor, but an upgrade can be bought so perhaps one day it will be done since the lathe is of a quality that should cover my needs in the future also. If you get a good price on one of these or have a small work shop like me, I would have no doubt when saying ‘buy one’. The new version of the lathe prized at 270 Pound / 435 US for the lathe alone. 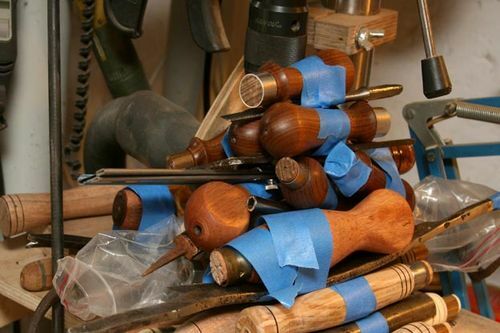 I was lucky to get it cheap, used, it was the second lathe of a professional turner and he had made a upgrade – since I had just bought a lightweight lathe this was a wonderful upgrade for me also I paid 200 US for the Record lathe with all the extras included (total new price app. 700 pound / 1100 US) and sold the old for 130 US – so I was happy for this cheap but huge quality upgrade. With the lathe I got a wood screw, two face plates and a collet chunk set set. I also had the luck to get a stand for it, but since my work shop is so small I have put that away for now. Finally a bowl turning attacment was also thrown in the deal. 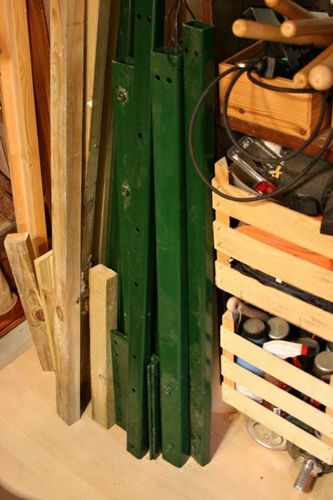 I had some really bad irons that came with my first lathe and changed them into some HSS and a few Kirchen so now I have the basics I need and made a cabinet for the tools. Hope it could be useful, even it was a mess, the review I mean. (And sorry I was a little slow, I had limited energy lately). Are Record lathes sold here in the US? I guess I will have to check it out. 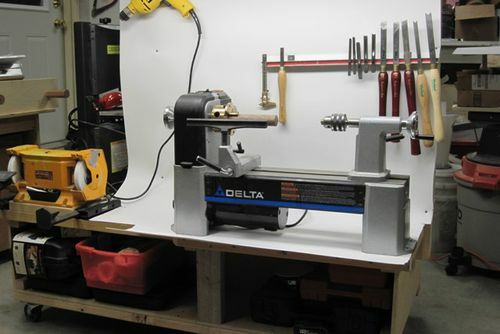 I do have the Delta 46-460 and it is an awesome lathe and turns to 12 1/2” , but I would like something to use for outboard turning also. Hi Mads, that looks like a fine lathe- the rails look to be abut 2”. I’ll bet you can do some great things on there! You my friend are a dam good turner…. if any of your handles run over in abundance for space…lol…....please let me know….great work and highly admired! Thanks for the post! Hi Mads, glad to see you’re happy with your new addition and I see you have already got started, good for you. You can look at youtube for wood turning, some of those videos are good. I got a DVD with my Tormek and I must say the instructions on turning are excellent. Thanks for sharing Mads, enjoy!! glad you are happy with your lathe..I have a very old record mini-lathe and it is built like a tank. So record makes good stuff. the only issue I see is the bedrails..the tubes are really not stiff enough for heavy turning..but it sounds like you aren’t going to strain it, so I’m sure it will be fine. mafe thanks this will be my goto review when i am asked. the forum i am in people ask about them a lot and i havent had much to say. Joe was it you that askede me to do the review, I could not remember? (Sorry for my bad memory).